The single finest 1891-CC $10 gold coin, graded MS65 by NGC, is an important highlight of Heritage Auctions’ upcoming September Long Beach Auction, Sept. 23-25. Heritage will present this Mint State 1891-CC Gold Eagle rarity from the Old West. It is expected to bring $60,000+ in the September Long Beach Auction held September 23-25. It is the most important coin in The Dr. Mani and Kay Ehteshami Collection. "Even in the 21st century, the allure of the Old West remains powerful, and coins from the Carson City Mint are among the most evocative of that time," said Greg Rohan, President of Heritage. "The Carson City Mint started striking coins in 1870, just six years after Nevada achieved statehood. It was effectively a frontier operation, and keeping it open was a constant struggle. Its minting operations were shut down from 1885 to 1889 and closed for good in 1893." The Carson City Mint struck silver and gold coinage. 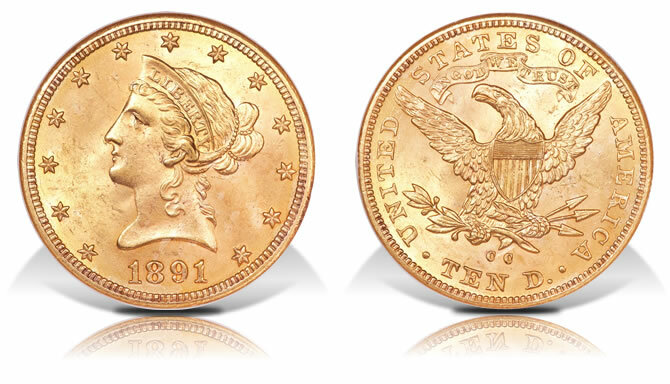 It is most famous for its largest coins, such as silver dollars and ten dollar and twenty dollar gold pieces, otherwise known as "eagles" and "double eagles." "Carson City had its highest production of $10 gold pieces in 1891, when just more than 100,000 pieces were struck," said Rohan. "It never had a six-figure mintage for that denomination before or after. Many examples have survived, including a number of Mint State coins, but at MS65, the Ehteshami example is the best-preserved of all." Not only is the Ehteshami example the single finest example of the 1891-CC $10 issue, it is one of just three Carson City $10 coins graded MS65 or better, regardless of date. The others are dated 1874-CC and 1882-CC. While a high mintage or survival rate can create a supply of Mint State coins, the existence of a superior Mint State coin, such as an MS65, is far more random. The rough conditions of Carson City at the time make such a coin’s existence all the more remarkable. "Careful preservation and the purest chance made the Ehteshami example what it is, and the world of Carson City coin collecting is the better for it," said Rohan. "Our cataloger called it ‘the 1891-CC eagle that all others wish they could be.’ More than that, it is the 1891-CC eagle that all Carson City collectors wish they could own, but there can be only one winning bidder." The coin is estimated at $60,000+.